"I wonder where Pam went"
My worst nightmare came true this weekend. Michael showed up at my retail job. I knew it was coming. When I started working at the shop in Viewpoint Mall, Michael hadn’t even heard of the store before. Then a week and a half ago he tells me Jan and her sister discovered the shop, and she just LOVED it. I wasn’t too too worried. I knew that there was another location of the store closer to where Michael lived, and he never talked about coming to my part of town for anything. I figured I was safe. I was helping out at the registers when I saw him turn the corner waving at me, Jan in tow. Luckily it had slowed down and I had just signed off my register. I gave a quick grunt that sounded somewhat like a hello and hopped on a telephone as quick as possible to call one of the other departments with some inane question. Jan and Michael camped out just to the right of me while I was on the phone. I turned my head to the left as if looking for something and as soon as I was done on the phone, hung up and bolted in the opposite direction of them. I then hid in a stock room until I was sure the two were gone. Why Michael? Why must you torture me everywhere I go? So as I said in my last post, I decided to focus my efforts this summer on changing my life instead of complaining about it. And I made some noble attempts. I now have a couple of freelance ventures that I’m pretty proud of. I mean they haven’t brought in enough income to replace either of my jobs, so they really have only created more work on top of my two jobs for me. But whatever. I enjoy them. The job search is still in limbo. Mr. Beesly and I have a pretty nice vacay planned in a month or so. And I have really no time off between now and the end of the year for interviews. So a full-force effort might not start until then. 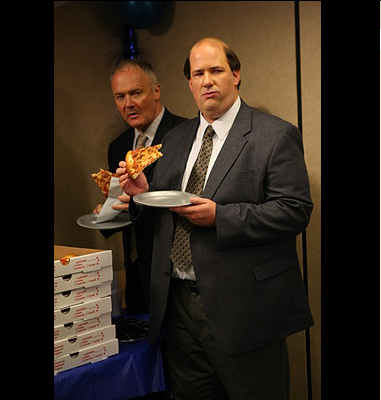 Though sales positions has opened up at Dunder Mifflin and I am considering going for it (SEE! Reality mimics art AGAIN). I’m not totally qualified, but neither was Pam on the show … so why not go for it, right?! This would mean Michael would not be my boss anymore, but I’d still be close enough to hear him and mock him. It’s a win/win for everyone! I’ll keep you posted on my decision. I’ll try to recap some of the events of this summer as I remember them, but honestly I have blocked a lot of it from memory. Jim almost quit, we had evaluations, we had a company picnic, and we stressed Michael out so much by not talking to him that we have given him (alleged) sleeping problems. More on all that later. I missed you guys! 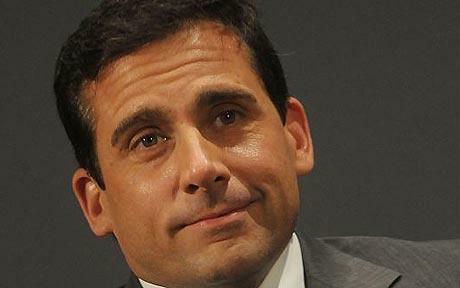 Michael Scott ponders the meaning of life -- as seen on TV. So it’s been a rough few weeks at the Beesly household. A younger cousin of mine died a few weeks ago, and a week later, grandma Beesly was rushed to the hospital, where she spent a week and a half. It was touch and go for a while. Scary stuff. Hence my lack of blogging. Aaaaaaaaanywho. Let us not dwell on that. The headline promises funny. So the day before my cousin’s funeral, Michael decides to offer comfort in an oh-so-Michael way. After establishing how sorry he is and that he hopes everything goes OK at the funeral (a perfect and polite response from someone not close to the family), he decides he can’t leave it at that. He must follow-up with a heartfelt cherry on top — that perfect comment that will really linger in my heart and help me through these hard times. “You know, Jan and I watch a TV drama with a subplot where a character died like that. And gosh, that’s just really hard,” Michael said forlornly. This was one of those rare moments in life where my jaw literally dropped — not just in my head. I don’t know why I was surprised. Just a few months earlier, Stanley had a funeral of a close friend, in which Michael stepped in with comforting words about one of Jan’s friend’s brothers (whom he’d never met) dying in the same way. But at least that was a real person. There. See that’s where you should have stopped the first time. Now how can we train you to stop there every time? So, like The Office (duh) we got a new secretary not all that long ago. Today she had to be late because of an emergency that came up at home. When she came in she had a few cookies wrapped for Michael. “What is this? Bribery?! For being late? !” He said with a jovial laugh. “No it’s just a thank you for being SO understanding,” Erin said in her sweet as sugar voice. Oh thank god I hadn’t eaten my breakfast yet. My stomach churned simultaneously with my brain as I remembered all the times Michael came in late this month alone, for no reason whatsoever. Oh dear Erin, you have SO much to learn.